The 1” soft dome tweeter provides smooth, refined high frequencies, with a 5” polyfiber woofer for balanced, musical low end. The integrated WaveGuide focuses the high frequency sound for dynamic, true-to-life reproduction, while the rear-firing port allows for better low frequency extension. The compact cabinet of the S 805 allows for extremely versatile placement options, whether it’s part of a high performance home cinema, or standing alone as a 2-channel listening system in a chic, fashionable living space. Engineered to belie its small cabinet size, the S 805 is specifically designed to provide exceptional output and balanced, full sound in any application despite it’s small stature. The new Jamo Studio 8 series has been completely reimagined to live seamlessly in modern, premium environments. Contemporary material and finish choices accentuate the clean, minimalist lines of this European design, while the compact cabinet designs are an ideal solution for urban living environments around the world. Fully magnetic grilles – no mounting holes or push pins – for a clean, minimalistic front baffle design, while the large woven linen grille cloth creates visual interest with heavy texture. 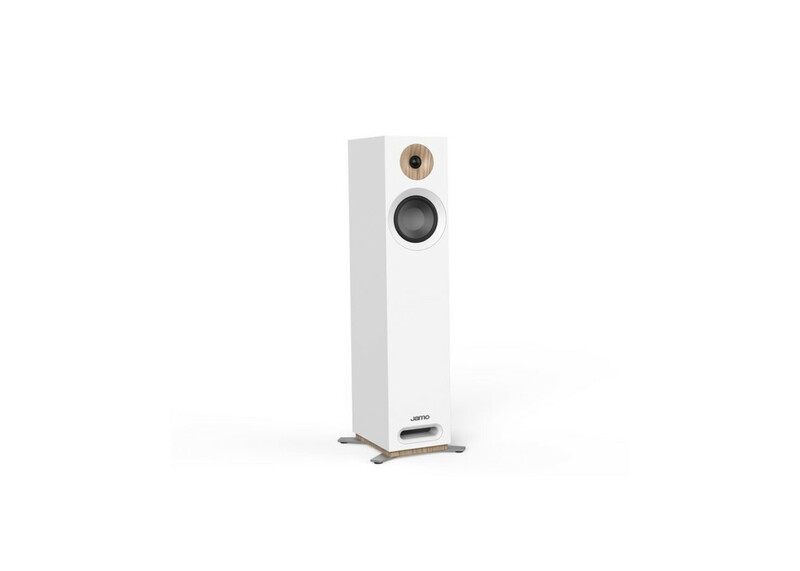 The S 805 floorstanding speaker includes a fully magnetic grille for premium look and feel, wood accents give handcrafted, natural aesthetic. The front firing tube port improves low frequency extension while maximizing placement options.